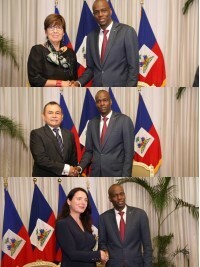 Thursday at the National Palace, President Jovenel Moses, received the credentials of three new ambassadors accredited to Haiti. These are their Excellencies Jehanne Roccas (Kingdom of Belgium), Annemieke Verrijp (Kingdom of the Netherlands) and Francisco Javier Torres Gonzales (Republic of Panama). These new ambassadors renewed their commitments to maintain close ties of friendship and strengthen bilateral cooperation between Haiti and their respective countries. President Moïse also reassured these ambassadors of his willingness to work together for the harmonious development of relations between Haiti and these three friendly countries.